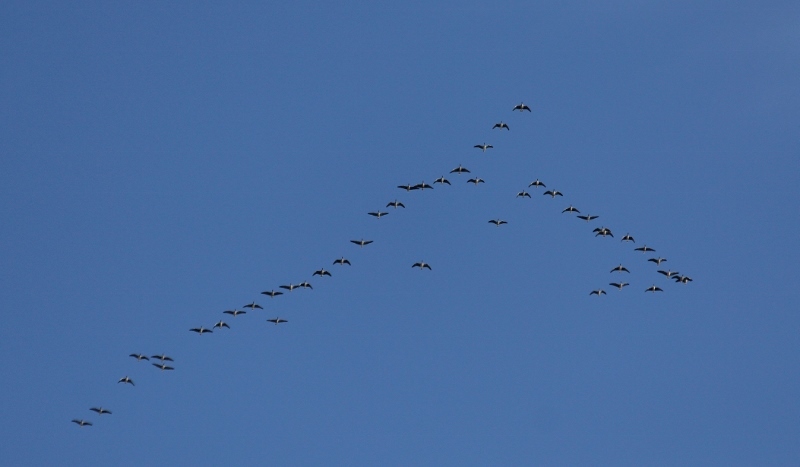 Migration watch; 16.10 - 19.00hrs. On the move (south unless stated) were 2 Red-throated Diver, 2 Cormorant, 28 Common Scoter north, 2 Greenshank, 2 Black-headed Gull, 1 Common Gull + 2 north, 4 Great Black-backed Gull north, 25 Kittiwake north, 28 Meadow Pipit, 1 Chaffinch, 3 Siskin and 2 Goldfinch. Five Chiffchaff were on Castle Hill and 14 Wigeon and 11 Teal were on Johnson's Marsh. The 20th was much more lively with the first Pink-footed Geese of the autumn and the south bound Common Buzzard record being smashed! Migration watch; 06.30 - 15.30hrs. On the move (south unless stated) 19 Red-throated Diver + 13 north, 2 Sooty Shearwater north, 1 Manx Shearwater, 13 Cormorant + 7 north, 46 Pink-footed Geese, 2 Mallard, 99 Common Scoter north, 1 Sparrowhawk, 17 Common Buzzard, 1 Kestrel, 1 Merlin, 1 Peregrine, 2 Golden Plover, 1 Arctic Skua north, 18 Black-headed Gull + 61 north, 13 Common Gull north, 1 Lesser Black-backed Gull north, 25 Kittiwake north, 4 Sandwich Tern, 20 Auk sp + 5 north, 1 Swift, 1 Great Spotted Woodpecker, 34 Skylark, 12 Swallow, 282 Meadow Pipit, 6 Rock Pipit + 1 north, 8 Alba, 1 Blackbird, 2 Starling, 11 Chaffinch, 28 Goldfinch, 34 Siskin, 163 Linnet, 40 Redpoll sp and 1 Yellowhammer. In the Long Nab area there were 200 Linnet, 1 Blackcap, 4 Chiffchaff and 3 Goldcrest. On Johnson's Marsh there were 14 Wigeon and 12 Teal and a Grey Plover was in Jackson's Bay. 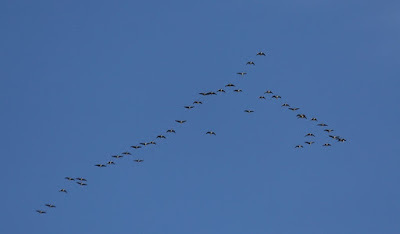 The first Pink-footed Geese of the autumn head south at Long Nab - Michael McNaghten.